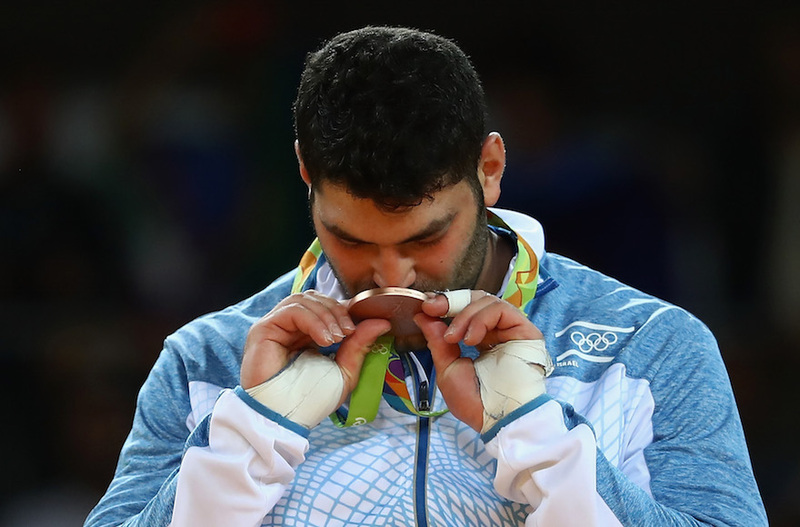 RIO DE JANEIRO (JTA) – Ori Sasson of Israel won a bronze medal in the men’s judo over-100 kg. competition. Sasson gave the Israeli delegation its second medal at the 2016 Rio Olympics, both bronze in judo, with his victory over Alex Garcia Mendoza of Cuba on Friday night. It is the first time Israel has claimed two Olympic medals since 2004. Prime Minister Benjamin Netanyahu spoke to Sasson by phone on Saturday night from Jerusalem in a call that was aired live on Israel’s Channel 2. In the semifinals, Sasson was beaten by seven-time world champion Teddy Reiner of France, who went on to take the gold medal. On Thursday, Sasson defeated Egypt’s Islam El Shehaby, who refused to shake the Israeli’s outstretched hand and walked away to boos from the crowd. The slight underscored the neighboring countries’ strained relations 37 years after signing a peace agreement. On Aug. 9, Yarden Gerbi won Israel’s first medal in Rio, a bronze in the women’s 63-kg judo competition. It was the first Olympic medal for Israel since 2008 in Beijing.